Source of title proper: Title based on contents of the fonds. The Reform Party of Canada was born out of a sense of frustration and disillusionment amongst a coalition of western Canadian businessmen and interest groups with what they regarded as the federal Progressive Conservative Party's disregard for the West's contributions to the political and economic well being of the country. Led by Preston Manning, the son of long-time Alberta Social Credit premier Ernest Manning, the coalition supported the creation of a western reform movement as a means of voicing the West's discontent and as an alternative to western separation. Some of the supporters of this idea advocated the creation of a new federal political party promising fiscal responsibility, provincial equality that allowed no special status for Quebec, and parliamentary reform which would include an elected Senate to represent the regions. 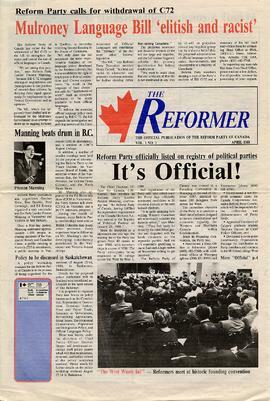 In May 1987 the newly established Reform Association of Canada organised the "Western Assembly on Canada's Economic and Political Future" in Vancouver to air a reform agenda and to discuss the establishment of a new political party. The Assembly's 300 delegates voted 75% in favour of forming a new political party. In October of that year delegates gathered in Winnipeg to found the Reform Party of Canada, and elected Preston Manning as its leader. In the 1988 federal election, the Party fielded 72 candidates in the 88 ridings west and north of the Manitoba/Ontario border. Although none were elected, the Party succeeded in coming second in 15 ridings in Alberta, receiving 15% of the popular vote in that province. In March 1989 the Party elected its first Member of Parliament when Deborah Grey won a by-election held in Beaver River, Alberta. In the same year Reform candidate Stan Water's became the country's first "elected" senator. By 1990 the Party was a significant political force in the West. Hard campaigning against the Charlottetown Accord brought the Party to national attention. In the federal election of 1993 the Party upset the political establishment by electing 52 Reformers to sit in the House of Commons (including 22 of 26 seats in Alberta and 24 of 30 seats in British Columbia), helping to decimate the Progressive Conservatives in the process. In the 1997 general election Reform increased its seat total to 60, enough to install Manning in the office of the Leader of the Opposition. However, all of Reform's members were from west of Ontario. The Canadian political geography had split mostly along regional lines, with Reform in the West, the ruling Liberals in Ontario, and the Bloc Québécois in Quebec. Discontented with being perceived as a regional party, Manning proposed a radical solution. In September 1998 he initiated the "United Alternative" movement to bring together conservatives from all political backgrounds in an effort to "unite the right", produce a national party and end the vote splitting and stalemate that had resulted from the Progressive Conservative Party and the Reform Party running candidates in the same constituencies, thus allowing Liberal Party candidates to win ridings in which the majority of the electorate was right-wing. Two United Alternative conventions were held in 1999 and 2000 which lay the groundwork for a new party by bringing together supporters and organisers from a variety of right-wing parties, accepting policies, principles and a constitution that was drafted between the two conventions. On March 25, 2000 members of the Reform Party voted 92% in favour of dissolving their party and adopting the constitution of the new political party, and the Canadian Alliance was born. The fonds consists of records produced and collected by staff and volunteers of the Reform Association of Canada, the Reform Party of Canada, and the United Alternative. The records transferred to the Archives were those held at national office in Calgary only. Further records relating to the Party are held in Ottawa. Fonds has been arranged into 18 series including: (1) Reform Association of Canada and related records, (2) Administrative records, (3) Executive Council and committee records, (4) Legal services, (5) Assemblies, (6) Policy, (7) Constituency development and election readiness, (8) Financial administration, (9) Communications, (10) Leader's office, (11) Fundraising and membership development, (12) Speeches, (13) Video recordings, (14) Audio recordings, (15) Photographs, (16), Ephemera, (17) Reform Party of Alberta, and (18) United Alternative records. Includes 34 boxes (10.88 metres) of moving image documents, 295 audio cassettes, 80 cm of graphic material, 25 banners, 2 boxes of ephemeral material, and 7 audio reels. The records were transferred to the University Archives from the Canadian Alliance Party in several batches. An initial transfer of 154 boxes occurred in November 2001. The Party's preparation for a relocation to new offices in the summer of 2002 resulted in transfers of a further 62 boxes in July and 42 boxes in September of that year. In July 2002 the Archives became aware of a large quantity of boxes stored in a commercial storage facility in Calgary. Arrangements were made to transfer the boxes into the custody of the Archives while a survey and appraisal of the records was undertaken. As a result of this process a further 127 boxes of records were added to the permanent collection the University Archives and the remaining records (mainly low level financial records such as invoices, duplicate tax receipts, and membership application forms) were scheduled for destruction over a seven year period in compliance with the requirements of the Income Act. The Reform Party established its own archives in 1992 in an effort to ensure that records of its activities were preserved. The archives was staffed by volunteers who had no formal archival training, but who made some effort to understand basic archival principles. Records apparently often arrived in the Party's archives in a state of disarray, sometimes one file at a time, and with little indication of the office or officer of creation. The initial 154 box transfer of records were rearranged, accessioned and described by Party volunteers, often with a subject orientation in mind rather than by attempting to identify the office of creation and grouping records from the same unit together. It is therefore often impossible to tell who created a file and where it properly belongs in the fonds as a whole. Similarly, it is impossible to know what records were destroyed over time as a result of appraisal decisions made by the Party's staff. The later transfers of records were somewhat disorganised and again it was not always possible to tell which office had created a file. As a result of the disarray the records were received in and of the fact that the Party organisational structure fluctuated frequently (sometimes 2 or 3 times in one year), a decision was made to organise the records mainly based on the main functions of the Party which remained constant. These are such areas as policy, membership development and fundraising, financial administration, constituency development and election readiness. There are no restrictions on access.